I have to admit, that I was a little dismissive of the GNRS in the post below. Maybe part of it's projection: as a NorCal to SoCal transplant, I realized that Northern California is where I like myself better. I'm more at home there; more at ease. Los Angeles is an amazing, wonderful place full of stuff you'll never find anywhere else, or at least not in the same combinations. What's more, it's the birthplace of hot rodding, low-buck land speed racing and drag racing. It gave us Hot Rod magazine, the So-Cal bellytanker, the Doane Spencer Roadster and the Pierson Brothers Coupe. Chevy-Powered Ford Wins America&apos;s Most Beautiful Roadster! But I'm a Northern California boy at heart. And while Southern California gave us Barris Kustom as we know it, bombas and lowriders, Sacramento produced the Barris Brothers themselves. 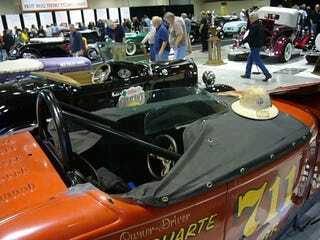 Northern California gave us quite a few rodding heroes and notable cars as well — plus Oakland (which in hot rod parlance is still slang for the Grand National Roadster Show, despite the fact that it actually hasn't been held in the East Bay city in nearly a decade. In fact, I attended the first GNRS in Pomona, and it was miles better than it had been in the previous limbo years, when it was held in dismal San Mateo. "The problem with the ISCA / Ridler /AMBR scene is not politics, but really a lack of politics. Because of the proverbial "no accounting for taste," the judging criteria gets scaled back to the hyper-objective: absence of dust. Flawless chrome. Laser-straight body gaps. The lower the weight on subjective things like aesthetics, the less the bitching from losers. Over time this has driven up the cost of competing for the top awards, while simulataneously suppressing innovation." Sure, it's there in the comments, but I think it certainly bears repeating. And furthermore, it's simply the aping of a style. You wanna win AMBR? If Foose isn't competing, see if you can enter a car based on one of his designs and have a team of incredible craftsmen realize it. The thing is, it feels like it's getting dire; to the point where 1970s-style Resto Rods are becoming cool again; which means that hot rodding, given the exponential acceleration of culture these days, will be back to the chunky billet days of early Buttera and Coddington cars. The rat-rod scene is full of Mike Ness wannabes, the hyper-rod group is full of aspiring "coachbuilders," and it's all just gotten a little gross. Over Christmas, I was hanging out with an uncle, who in his retirement has taken to tinkering with hot rods. He's got a couple of Deuces and just picked up an A panel project car. And he said, "Do you get the feeling that this hot rod thing is gonna shake out? I mean, I know it'll survive, but it seems like it's shrinking."